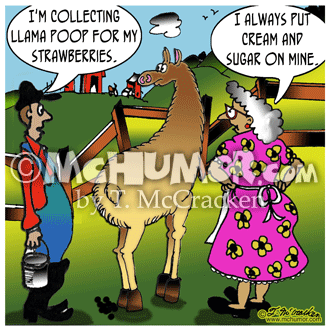 Llama Cartoon 9089: Someone saying to a llama rancher, "I'm collecting llama poop for my strawberries." The rancher says, "I always put cream and sugar on mine." 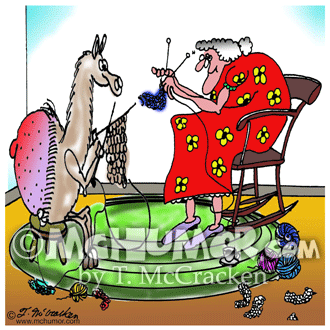 Llama Cartoon 3474: A llama knitting a sweater from its own wool. 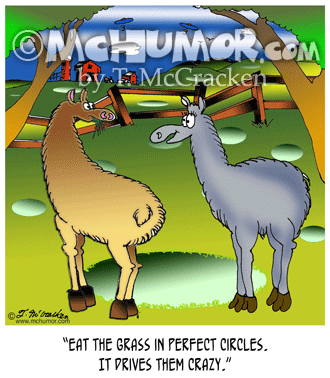 Llama Cartoon 8828: A llama says to another, "Eat the grass in perfect circles. It drives them crazy." 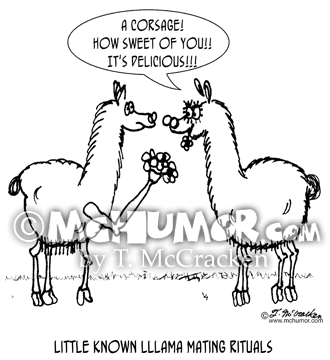 Llama Cartoon 3473: A llama saying to another holding out a bouquet, "A corsage! How sweet of you!! It's delicious!!! " "Little known mating rituals of llamas." 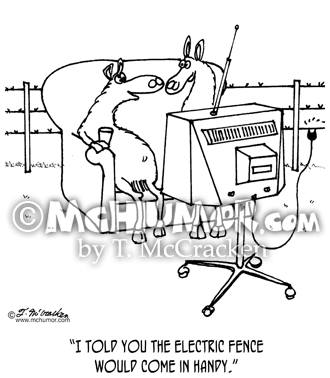 Llama Cartoon 3472: A llama watching a TV hooked to a fence saying to another, "I told you the electric fence would come in handy." 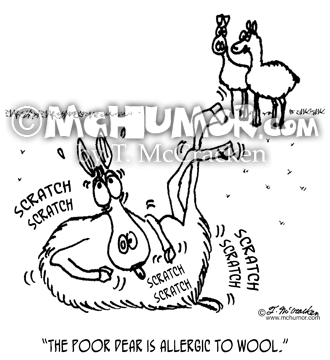 Llama Cartoon 3475: A llama watching another scratching says, "The poor dear is allergic to wool." 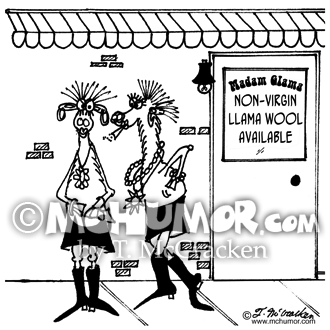 Llama Cartoon 3517: A couple of floozy looking llamas stand outside of "Madam Glama" that advertises, "Non-virgin llama wool available." 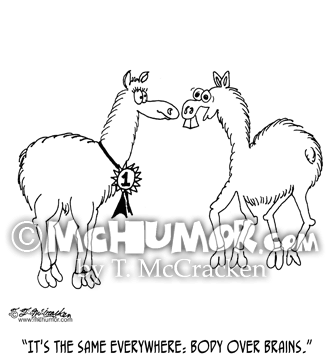 Llama Cartoon 5599: A goofy looking llama at a fair says to a prize winner, "It's the same everywhere: body over brains." 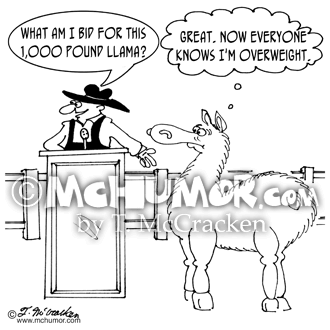 Llama Cartoon 5598: An auction of a llama an auctioneer shouts: "What am I bid for this 1,000 pound llama?" The llama thinks; "Great. Now EVERYONE knows I'm overweight." 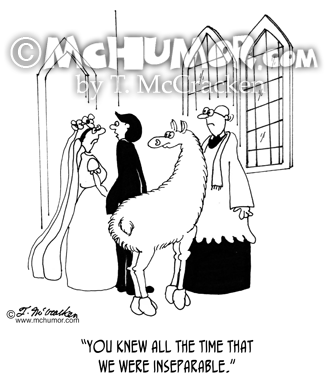 Llama Cartoon 5601: A man with a llama says to his bride at the alter, "You knew all the time that we were inseparable."